I'm the meteorologist for KING 5 Mornings. 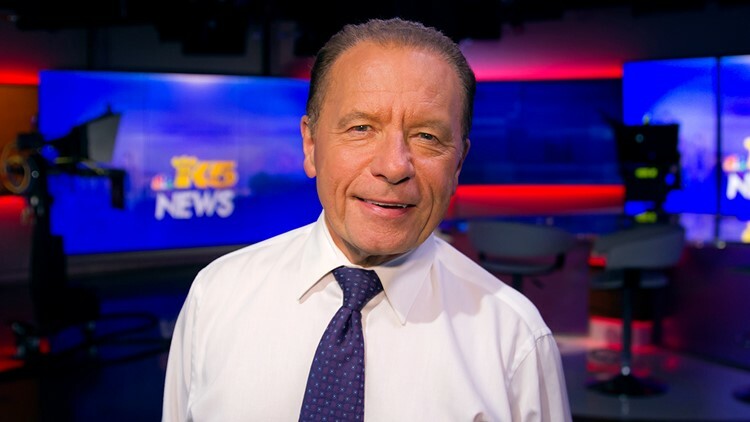 I have had the amazing experience of forecasting weather in Washington for almost 43 years, and I have had the privilege to be part of KING 5 for 31 years. It's been made more amazing by the fact that I never had any plans to be on TV! I grew up in Long Beach, California. Growing up I loved rain – which there is not much of in Long Beach. I used to always see a front over Washington, and I told my parents I needed to live there. I finally made it when I came to the University of Washington for graduate work in Atmospheric Sciences. However, first I spent 8 years in college at UCLA to receive a bachelor's degree in Physics and a master's degree in meteorology. During that whole time I was working in the meteorology department doing research on the earth’s upper atmosphere including computer modeling of the global circulation. It was fascinating research, and I had hoped to work in the space program. Unfortunately, as I was getting to the end of my graduate work, the space program dried up after the moon landings. So, I switched gears and moved to the UW grad school to study avalanches and mountain weather. This research turned into the Northwest Avalanche and Mountain Weather Forecast Center (NWAC). I worked for NWAC for 15 years, 12 years as a forest service meteorologist stationed in the National Weather Service Office in Seattle. We provided detailed mountain weather and avalanche forecasts to government and private agencies, as well as the public. As part of my duties, I got to spend a lot of time in the mountains checking the snowpack stability, teaching avalanche courses and installing some of the first remotely telemetered mountain weather stations in the Northwest. The work at NWAC took me into the red zone at Mt. St. Helens in 1980. My NWAC co-founder, Mark Moore, and I provided avalanche hazard information to the scientists working on the volcano. We got to spend time with the famous Harry Truman, and we got to see the transition of the Spirit Lake area from a beautiful, tranquil mountain scene to a moonscape dotted with erupting fumaroles and house-size pieces of ice from the destroyed glaciers! In the early years of NWAC, I had summers off and spent those summers working for the UW as Station manager for the Blue Glacier Research Project in the Olympic Mountains. In this capacity I maintained a research facility at the 6,800-foot level on Mt. Olympus and carried out research in glaciology, climatology and meteorology. As part of this I was occasionally involved in helping with search and rescue and educational programs for Olympic National Park. Over the years I have worked occasionally as a consultant in weather and avalanche planning. I am still actively involved in the snow and avalanche community as General Secretary of the Steering Committee for the International Snow Science Workshop (ISSW) – one of the leading international conferences on these topics. Through my work, I met all of the local TV weathercasters, and for reasons that still escape me, Harry Wappler – longtime Seattle weathercaster- suggested I should try it. Somehow, he succeeded in getting me an interview with KING 5. And even more unlikely, they hired me to do their weekend evening newscasts. For 3 years I worked both for NWAC and for KING. Finally, they offered me a full-time job doing weekday mornings. During my time here, I have had the good fortune to meet amazing people and have unique experiences. Probably my most memorable moments have been flying with the Blue Angels (a lifetime experience) and helping cover the Vancouver Winter Olympics (I still love snow). My one journalistic claim to fame was an Emmy Award for work on our special on Climate Change. Much to their embarrassment, I belong to the American Geophysical Union, the Canadian Meteorological and Oceanographic Society, and the American Meteorological Society (and have their Broadcast Seal). I’m also a professional member of the American Avalanche Association, and Board Member Emeritus of the Friends of NWAC (though that sounds like I should be dead). Over the years I have co-authored research papers in scientific journals, including Nature, Annals of Glaciology, Journal of Geoelecticity and Geomagnetism, Solar Physics and others. I have two wonderful and accomplished adult children and two granddaughters. I have also been blessed with another son, who is 6 years old and whose joy in life keeps me from ever feeling old (tired maybe, but not old). If I had spare time, I would spend it traveling, skiing, snowboarding, hiking, biking and pulling weeds. I have summited Mt. Rainier twice and backpacked long sections of the Pacific Crest Trail in Washington and California. I still have climbing Kilimanjaro on my to-do list with my daughter! Probably the best part of my career has been the awesome group of people I have had the privilege to work with and to call friends. They have been a remarkable group of dedicated professionals – many the best in their fields – and all really good people. I’m very lucky! You can reach me @rtmarriott on Twitter or email rmarriott@king5.com.